Risks. They’re not just in the workplace—they’re everywhere. Cutting your food at dinner, driving to the store to get milk, walking through puddles on the floor from your shower, and navigating around a dog toy at 2 a.m. have all caused someone varying degrees of pain at some point. The presence of risk is what makes these activities hazards. Technically speaking, the term risk is a mathematical way to measure potential loss, based on how frequently we come in contact with a hazard, how likely the potential loss is to happen, and, if it occurred, the possible severity of the loss. Personally, I’ve found that never leaving bed in the first place significantly decreases the likelihood of risk in my life. Unfortunately, life requires me to roll out of bed and face life’s many risks– so how do I and how can you, manage that? An internet search for “Risk Management” yields 233 million results – wherein (by my own estimate) approximately 200 million are pyramid-shaped. Where do you even begin to take action? In a work setting—especially a safety setting, risk management is a team effort. Two main pieces are required for a group initiative to be successful - a well thought out plan and engagement from all involved parties. Implementing a continuous improvement plan within your team allows you to provide a compelling proposal and motivate your crew to follow through. Once the team has identified risks, any safety program can customize this four-step process into its current regimen: Plan, Do, Study, Act. If you’re wondering what you need to do, the perfect start is a continuous improvement plan. 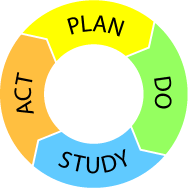 Once the team has identified risks, any safety program can customize this four-step process into its current regimen: Plan, Do, Study, Act. What exactly are you and/or the organization trying to accomplish? What is your purpose? Perhaps your goal is to drive involvement within your team. For a plan to be successful, it is imperative an objective is clearly defined. Start by comparing your current state to your ideal future state. Take a look at the safety observation programs of places that you would consider taking on as a role model of sorts. What are the gaps? What are you currently investigating in your observations, and who is performing them? Recognizing existing holes is essentially ripping off a Band-Aid. It may sting at first; but it will pay off in the long run by helping you and your safety program improve. Examine your existing checklists – are they relevant and easy to use? Ensure that you direct observers to view reoccurring areas of risk. The most effective observation teams incorporate diversity in their focus and composition. Are your observers all safety personnel? If so, maybe it is time to diversify your group. Once shortcomings are identified, take the time to generate a new observation strategy that will bridge the gaps, then set the expectations for observers, and communicate them thoroughly. Once the plan is finalized, take it upon yourself to lead your team to a successful execution. Data collection headaches frequently trace themselves back to employee participation. Collecting safety data is viewed as chore on their already bursting “to do” list. Make sure you do not police your team, but coach them to foster an enthusiastic and supportive environment. Group efforts rely on mass engagement. Become an endless supply of positive reinforcement to yield a better result. Set small, achievable, incremental goals for observers to accomplish; be sure to reward their completion. Use punishment sparingly, as data quality suffers when observers feel discouraged or fearful of making a “wrong” observation. Make a game out of the inspection strategy. Depending on the company’s culture, friendly competition motivates employees while adding a fun spin on what is otherwise “another thing to do”. Providing the best tools for the job makes observing easier for your team. Software is available for mobile devices that allows for real-time observing, the addition of photos, and automated data storage in the cloud. Data is both beautiful and thought-provoking, but if left unstudied, the accumulated bits of information might as well scream at you in Rongorongo (Google it). Allowing yourself the luxury of advanced reporting software deciphers your data into a story that with tangible talking points for your company as a whole. Investigate items such as the number of safe and unsafe observations in any particular area of interest– does it show a trend? Look at the number of observations that your observers have done over time and read into the quality. Once identified, track all trends to see how they continue over time. Are your at-risk numbers trending downwards as you expected or did M. Night Shyamalan pen the data’s plot twist? What does that twist mean? Enact a data use plan to ensure the proper communication of your data. Data use plans set guidelines on who is supposed to get what type of information and when it will be delivered. This ensures that the study of what you’ve collected consistently falls into the right hands at the right time. Planning, doing, and studying are all for naught if effort drops off before you evaluate and communicate the outcome. The actual improvement piece of continuous improvement happens once the trends found while doing and studying are compared to what was expected in the plan. Compare and contrast your newfound state to where you started and your ideal future state. How far have you come and how far do you need to go? Good news or bad, use it to identify gaps in your process and then update the plan accordingly. Appropriate feedback is crucial. Much like meals at chain restaurants, serve your feedback warmly and consistently. Ruling with an iron fist cultivates fear, discouragement, and sometimes defiance. When giving constructive feedback, clearly state what went wrong then provide ideas and encouragement on how to prevent it from happening in the future. Armed with an updated plan, begin the cycle again. Lather, rinse, and repeat until the risk management goals for your team are reached. Then, lift the bar even higher -- because the safety bar is eternal. Instead of ruling with an iron fist, continually inspire your team by setting a positive example in your own actions. Learn from the past, plan for the future, implement, then learn again. Oh, and remember, you still have to get out of bed for this.